It may surprise the million or so people in Britain who work for the minimum wage (set to go up by 19p to £6.50 per hour in October) that they are considered part of the world’s richest 10 per cent! Yes, according to the latest report form the World Bank anyone who has an income of more than $10 (about £5.95) a day belongs in the same bracket as Bill Gates, Carlos Slim, Warren Buffett, George Soros, and Ramon Abramovitch etc. If the working class has remained ‘poor’ only ‘less poor’ as it produces for the wealthy an ‘intoxicating augmentation in wealth and power’, then it has remained relatively just as poor. If the extremes of poverty have not lessened they have increased, because the extremes of wealth have. And all reports suggest that “the extremes of wealth” are now greater than ever (even greater than in Roman slave society some suggest) and are increasing. 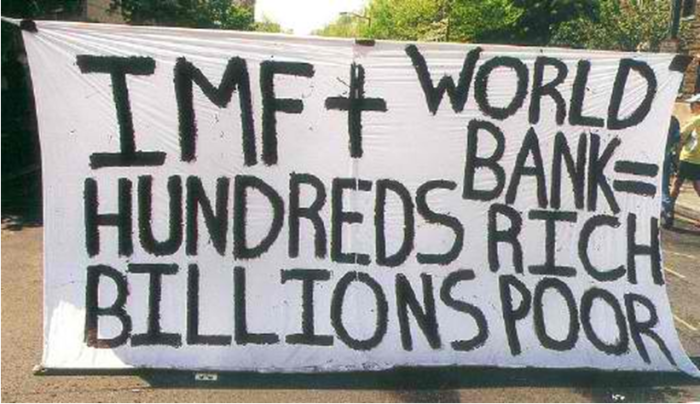 The richest 1% of the world’s population control half the world’s wealth and since the banking collapse of 2008 90% of all wealth gains in the US have gone to the richest 10%. But even the World Bank’s ‘happy’ scenario is not going to happen. World capitalism’s crisis — or as the World Bank prefers — “slowdown in growth”, is not going away. Any “recovery” has been a recovery for the rich. Millions who have only recently been lifted out of (official) poverty are (unfortunately) due to slip back into it. Many of the 2.8 billion people who currently exist on between $2 and $10 per day are likely to fall back into (official) poverty. Particularly vulnerable are the 1.5 billion people who manage to survive on between $2-$4 per day. And getting back to the minimum wage, in the UK even the ruling class are worried. Chancellor of the Exchequer George Osborne has tentatively called for a rise in the minimum wage to £7.00 an hour by 2015 (the OECD says that anything below £7.71 an hour today is a poverty wage). The Chancellor has not had a humanitarian conversion. He is worried that consumer spending will not rise enough to maintain even the feeble recovery they claim is happening. But this is a central contradiction of capitalism. The workers who create the commodities cannot buy them since profitable production requires lower wages. As Marx also noted “the last cause of all real crises lies in the poverty and restricted consumption of the masses”. the more productive capital grows … the more does competition extend among the workers, the more do their wages shrink together. Thus the forest of outstretched arms, begging for work, grows ever thicker, while the arms themselves grow every leaner. The only solution for workers everywhere is not an auction over how little they can get away with paying us – it is the abolition of the wages system altogether.